Linda Evangelista has been cast as the new star of the latest Dolce & Gabbana beauty campaign. 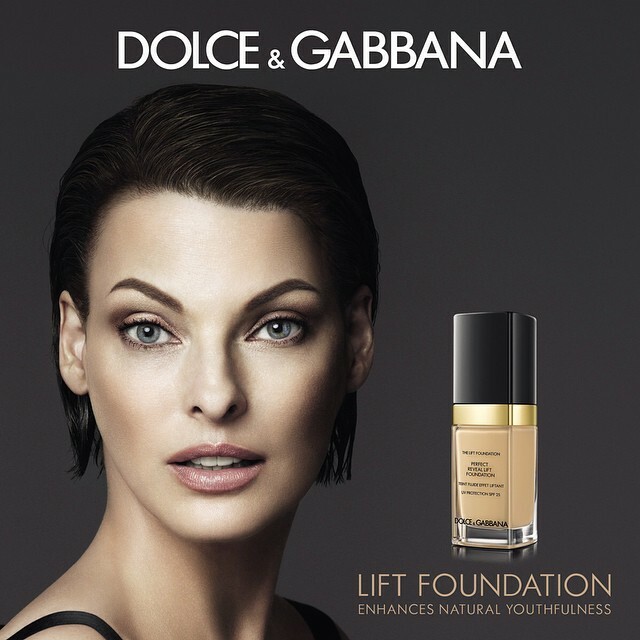 The 49-year-old supermodel become the face of Dolce & Gabbana Lift Foundation,” the new star foundation of the house, which promises to “enhance natural youth” of the skin. Lift Foundation promises a fresh face, but with natural effect and anti-aging properties thanks to its innovative formula. The novelty of Dolce & Gabbana arrives in stores by the end of 2014. It was on Instagram that Stefano Gabbana shared the first picture shot by the duo Mert Alas and Marcus Piggott. For the campaign, the styling was provided by Tabitha Simmons. Stéphane Marais worked on makeup and the hairstyle by Oribe. Reblogged this on ALL YOU TAKE.